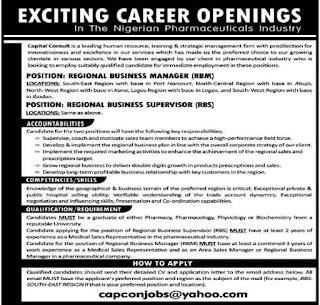 Capital Consult Exciting Career Openings in the Nigerian Pharmaceuticals Industry Job Vacancies and Recruitment for November, 2018. Capital Consult is .a leading human resource, training & strategic management firm with predilection for innovativeness and excellence in our services which has made us the preferred choice to our growing clientele in various sectors. 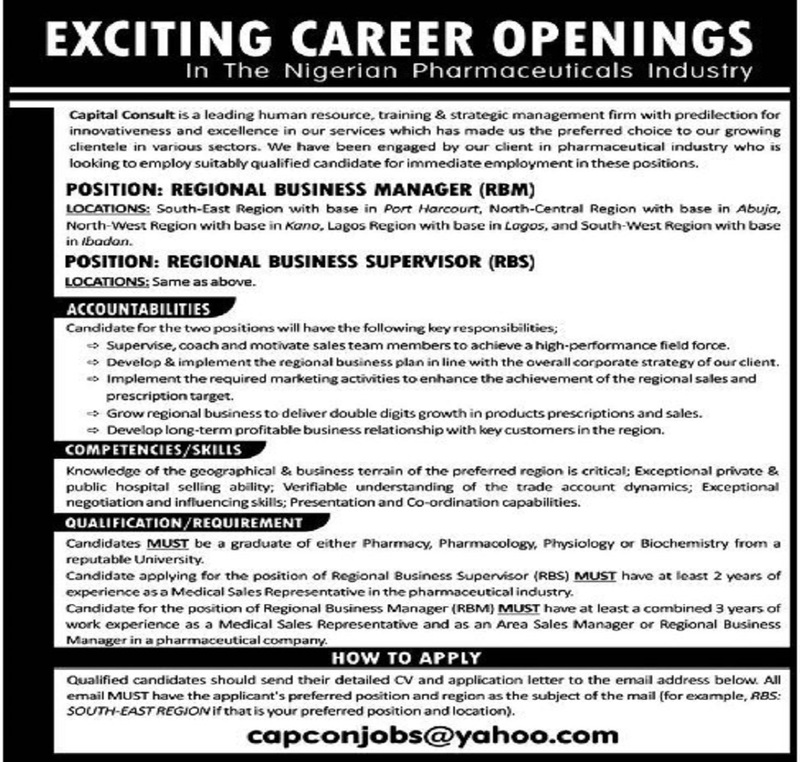 We have been engaged by our client in pharmaceutical industry who is looking to employ suitably qualified candidate for immediate employment in these positions. Supervise, coach and motivate sales team members to achieve a high-performance field force. Grow regional business to deliver double digits growth in products prescriptions and sales. Develop long-term profitable business relationship with key customers In the region. Exceptional negotiation and influencing skills; Presentation and Co-ordination capabilities. Candidate applying for the position of Regional Business Supervisor RBS) MUST have at least 2 years of experience as a Medical Sales Representative in the pharmaceutical industry. Candidate for the position of Regional Business Manager (RBM} MUST have at least a combined 3 years of work experience as a Medical Sales Representative and as an Area Sales Manager or Regional Business Manager in a pharmaceutical company. Qualified candidates should send their detailed Cv and application letter to the email address below. All email MUST have the applicant's preferred position and region as the subject of the mad (for example, RBS: SOUTH-EAST REGION If that is your preferred position and location).